Holiday.gr - Agios georgios- north west, a trip to a myth! 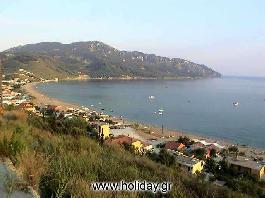 It is one of the most beautiful beaches of northwestern Corfu. It has been awarded with the Blue Flag from the European Union. It is ideal for those seeking for a quiet and a relatively isolated beach to relax. Characteristic of this beach is the blond shore and shallow waters. The small settlement stretches around the cove and has glorious view. Close to it are the villages Afionas, Prinilas, Agros and Kastellani that distinguish for their traditional architecture and the wonderful combination of green nature with dreamy shores. Been to Agios georgios- north west ? Share your experiences!